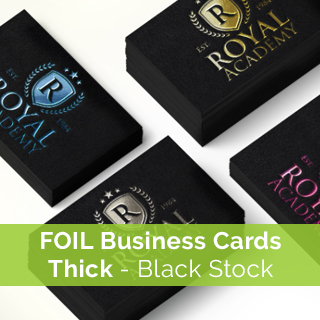 Foil printed business cards are a sensational way to impress clients. Nothing speaks ‘quality’ like gold foil. You can have an ‘understated’ look with minimal coverage or ramp it up with heavy accents for your own distinct stylish look. Indulge in the luxurious glamour of beautiful reflective metallic foil colours. Create contrast using silver or gold on dark backgrounds. Foil printing is actually hot foil stamping. Metallic foil is transferred via heat on the surface of your cards which gives them a glossy metallic hue. 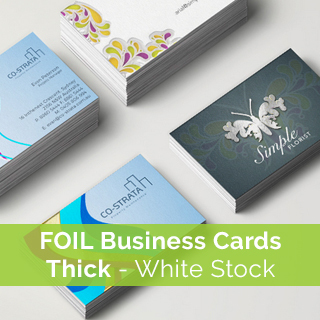 This specialty technique used to create hot foil stamped business cards has ‘raised surface’ characteristics and texture for a stunning result. Foil colours come in classic smooth and hologram finishes. Most popular choices are silver, gold, red, blue and green. Our professional foil printing service is available for all of Australia. Talk to us about your design and artwork needs. Custom designs for certificates and much more. Create the sparkle that always impresses with foil printed business cards.